In this article, you’ll learn how to automate the capture of email addresses (and other user information) into the email marketing service of your choice. 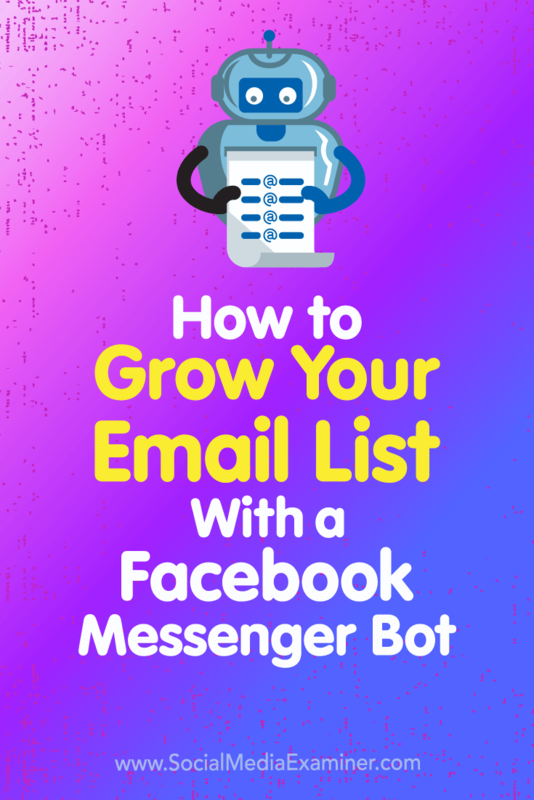 How to Grow Your Email List With a Facebook Messenger Bot by Kelly Mirabella on Social Media Examiner. With a few steps and integrations, you can start using your Messenger bot to build out your email list. This article shows you how to set up this process using the Pro version of ManyChat (starting at $10 per month) and the email marketing service of your choice. 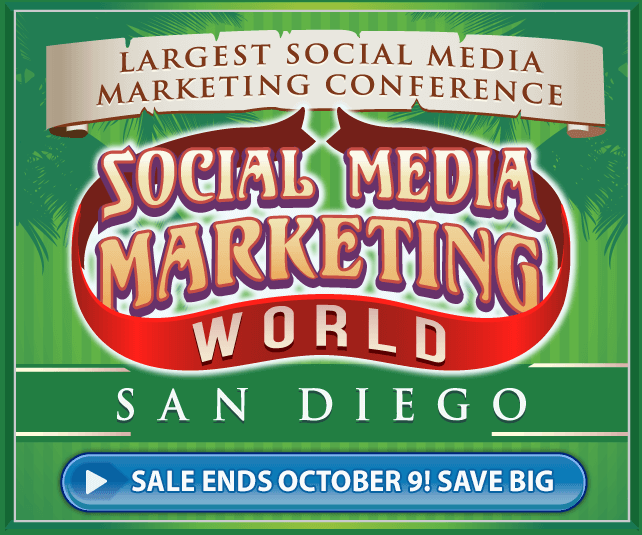 To get started, log into your email marketing service. Next, you’ll need to create a list to which you’ll add subscribers from your Messenger bot and set up any automated messages you want to send when users are added to your list. 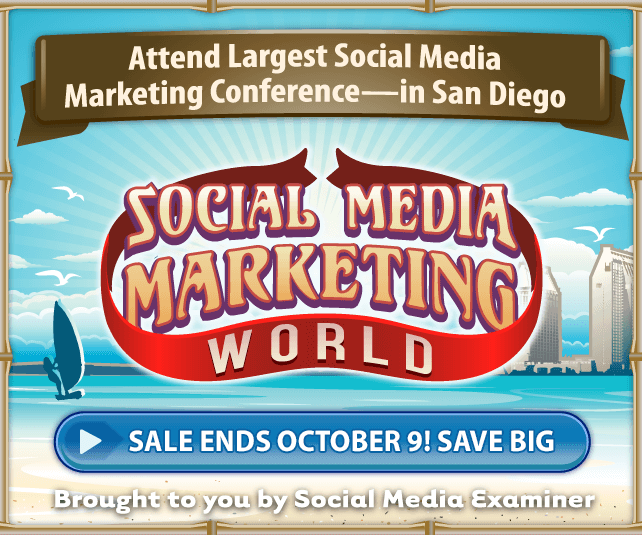 In this example, we’ll be using Mailchimp, which offers a free version. If you’re using a different email marketing service, adapt these general steps to create a list and automated message in your provider, and then skip to Step #3. 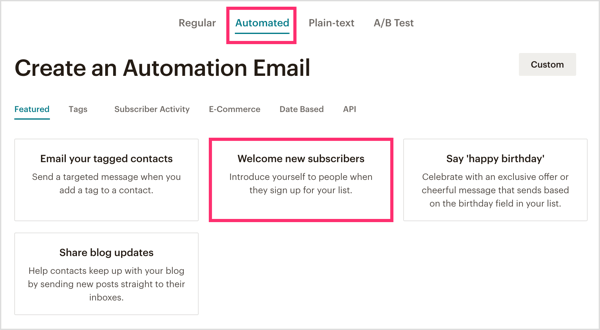 Once you’ve created a list, you’ll want to set up the automated welcome message. This message can range from a simple confirmation of being added to the list to an email that delivers a lead magnet or mini-course. Education Series is great for delivering eCourses, mini-courses, and/or tips and tricks via a series of emails. When you’re finished setting up your welcome message, the next step depends on which email marketing provider you’re using. If you’re using the built-in Mailchimp integration, proceed to Step #2. If you’re using a different email marketing service, skip ahead to Step #3 to tie it all together with a clever tool called Zapier. 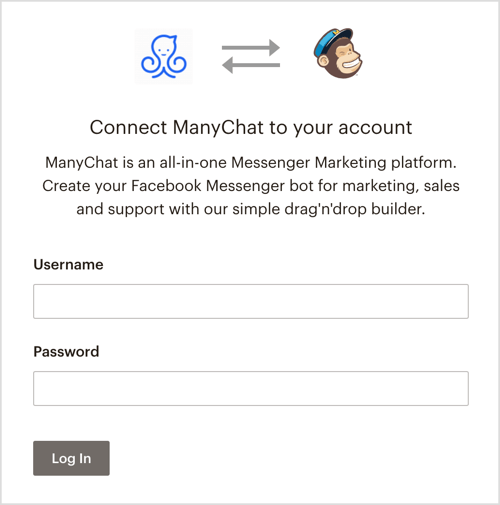 If you’re using Mailchimp, the built-in integration makes it easy to connect Mailchimp to ManyChat. 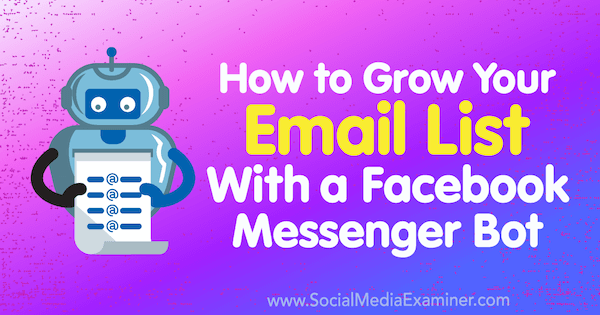 After that, you’ll set up your Messenger bot to ask for and capture the user’s email address. First, log into your ManyChat account and click the Settings tab on the left. 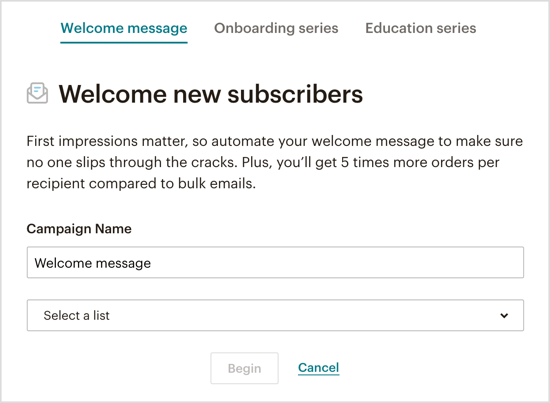 Click Custom Fields in the top menu bar and then click New User Field to create a custom field that saves the subscriber’s email address. 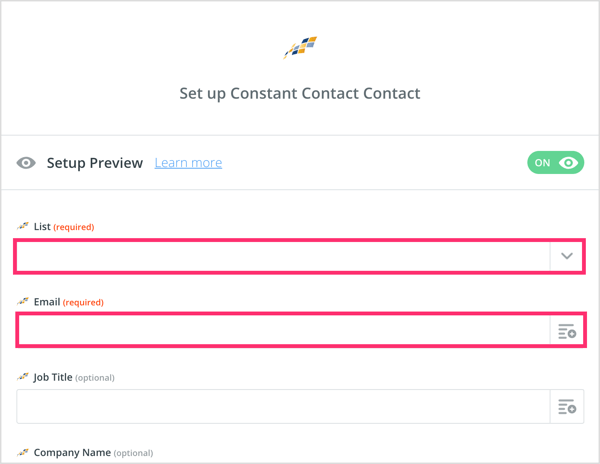 In the pop-up window, type in a name for your custom field (for instance, User Email or Email Address) and select Text from the drop-down menu. Then click Create. In Settings tab on the left, select Integrations in the top menu bar. Then click Connect Mailchimp Account. Note: If you don’t see Mailchimp as an option, skip to Step #3 below. Next, you’re prompted to sign into your Mailchimp account. 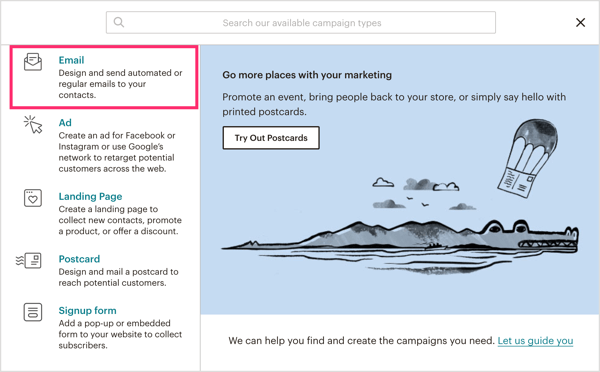 In the Mailchimp Integration section, click in the Email Field box and select the custom field you created to capture email addresses. 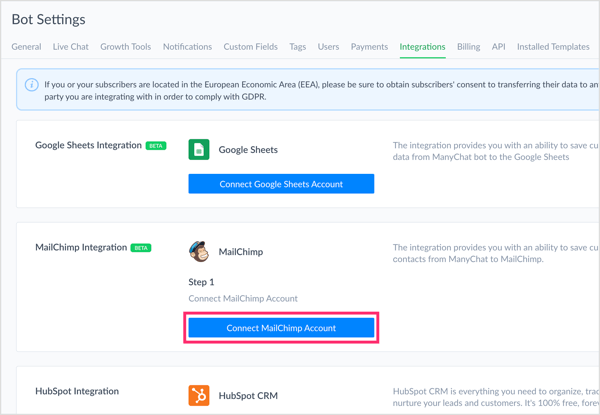 This step finalizes the integration between ManyChat and Mailchimp. Now that you’ve connected Mailchimp and ManyChat, the next step is to navigate to the Flows tab in ManyChat. In the upper-right corner of the page, click New Flow. Be sure to title your flow so you can organize and find it in the future. 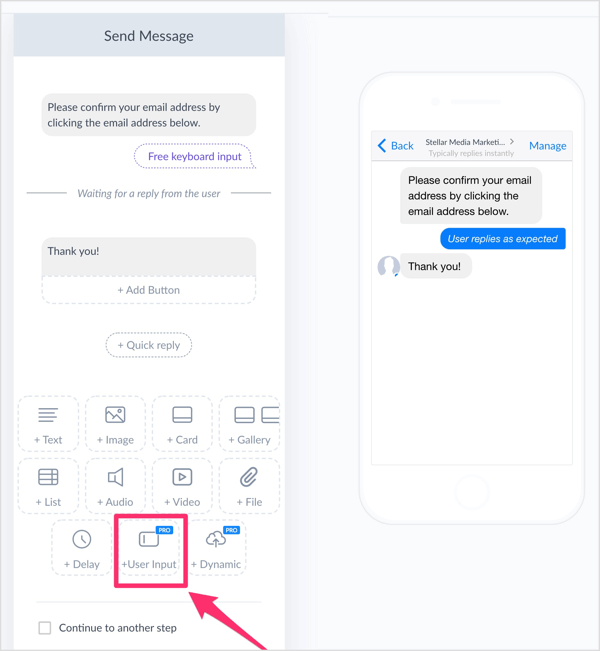 In your new Messenger bot flow, create your first message or any number of messages in your flow to help qualify your lead. When you’re ready to ask for the user’s email address, add a user input, which is a ManyChat Pro feature. In the Edit User Input pop-out, select Email for the Reply Type, which will help Facebook autopopulate the user’s email address in the chat. All the user will have to do is click on their address in the chatbox to confirm it or type in an alternate email if they wish. To capture this data properly, create a custom response. 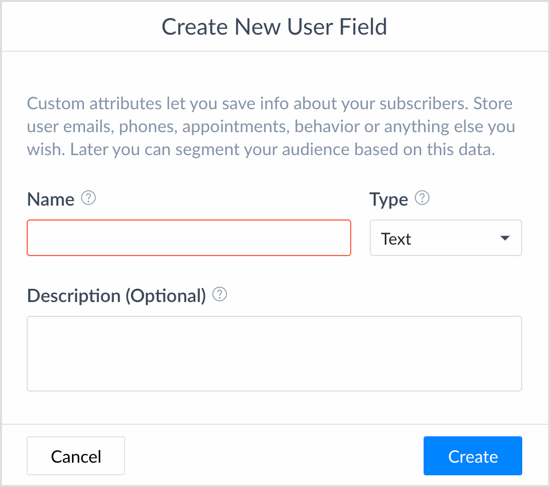 Under Save Response to a Custom Field, select the custom field you created earlier to save your subscribers’ email addresses. 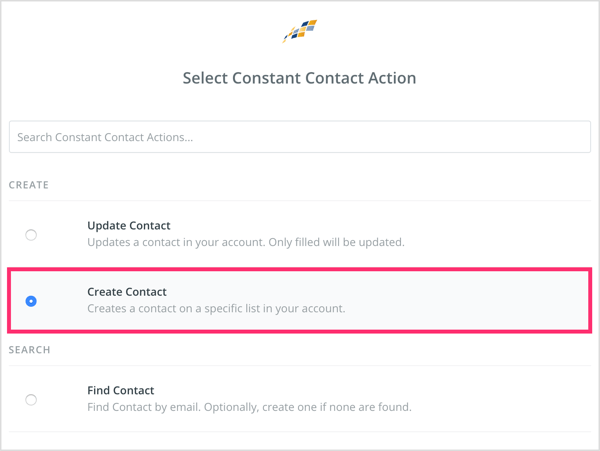 To make the connection from ManyChat to Mailchimp once someone confirms their email address, you need to create an action. Under Actions on Successful Input, click Action. The action you select depends on which email service provider you’re using. 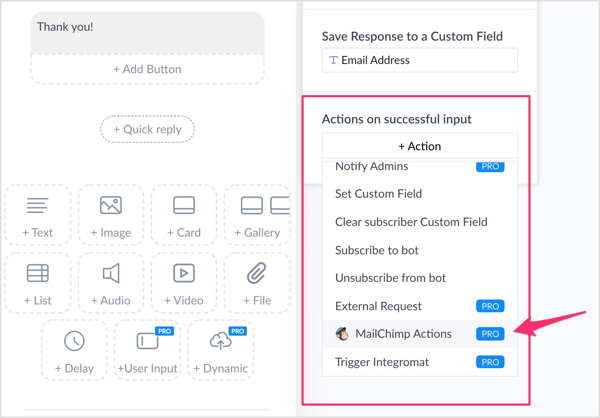 For Mailchimp, choose Mailchimp Actions from the list. Then select the list on which you want to have your subscriber land for this Messenger bot flow. Remember, this is the list you created in your email service provider in Step #1. That’s it! Your ManyChat flow can now be published and the user emails will be sent to the list you created in your email marketing service. Zapier is kind of a go-between for many apps, and there’s a free version. You’ll use it a lot with ManyChat to integrate with a number of different CRMs, email marketing tools, Google Docs, and the like. It’s a fantastic tool for making your Messenger bot smarter without having to know any coding language. Chances are Zapier has the email service provider of your choice if you don’t use Mailchimp. First, you’ll need to create a chatbot flow in ManyChat. Navigate to the Flows tab on the left and click on New Flow in the upper right. Add a name for your flow so you can organize and find it in the future. Now create your first message or any number of messages in your flow to help qualify your lead. When you’re ready to ask for the user’s email address, add a user input, which is a ManyChat Pro feature. To capture this data properly, you need to create a custom response. Under Save Response to a Custom Field, enter a name for the new custom field so you can easily access it in the future. I labeled mine Email Address. 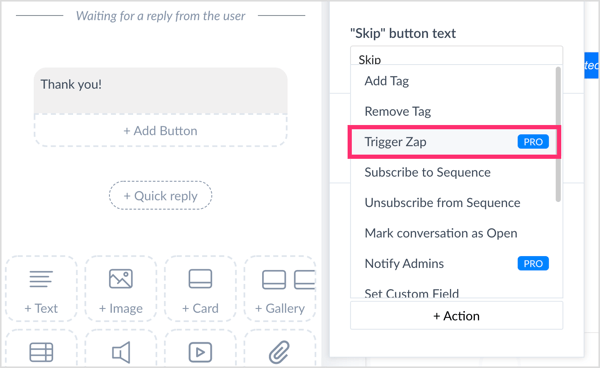 To make the connection between ManyChat and Zapier, and ultimately your email marketing service, click on Action. From the drop-down menu, select Trigger Zap. In the text box, enter a name for your zap. Then finish creating your message. Now that you’ve created the most important elements of your chatbot flow, the next step is to log into your Zapier account. On the main page, click the Make a Zap! button. On the following page, choose a trigger app. The trigger app is where the action is originated. In other words, it’s point A of your data that you want to get over to point B. In this case, the trigger app is ManyChat. If you haven’t used ManyChat as your trigger app before, you’ll need to search for it in the search bar. Now you’ll select the zap trigger. Click on Show Less Common Options at the bottom of the list and select New “Trigger a Zap” Event. Then click the Save + Continue button. You’re now prompted to connect and/or select your ManyChat account. 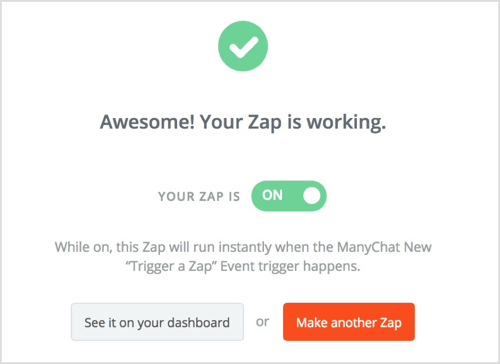 This allows Zapier to communicate with ManyChat and vice versa. This is where the fun begins! 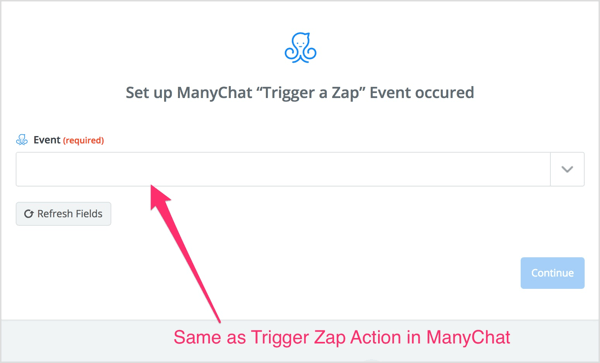 For the event, select the Trigger Zap action you just created in your ManyChat flow. Now you’ll need to connect the dots and select the data inside of ManyChat and Mailchimp from the fields inside of Zapier. This is how you create the path for which the data in ManyChat will get placed inside your email marketing service. From the List drop-down menu, select the list you created in your email marketing provider (refer to Step #1). 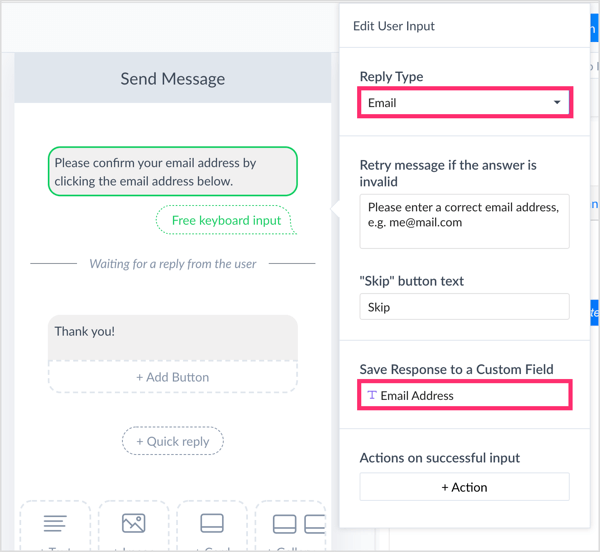 For Email, choose the custom field you created in ManyChat to save the user’s email response. With that, your ManyChat flow is connected to your email marketing service via Zapier. You can now go through and test it yourself to see if it triggers correctly. 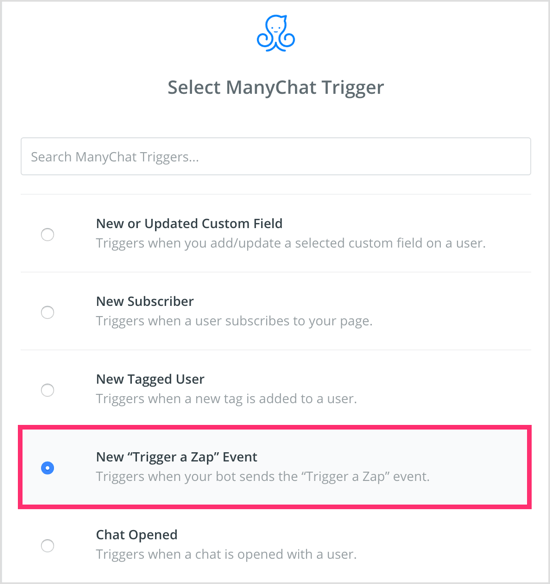 This is also a great time to create one of the many growth tools that ManyChat provides: start inviting new people to subscribe to your chatbot, or send out a broadcast to current subscribers inviting them to explore your new flow. With over 1 billion active users on Facebook Messenger, it’s one of the best places to connect with your target audience. But you should use caution when building your marketing on “rented” land. In other words, you need to own your data. That way if anything were to happen to Facebook or Facebook Messenger, you can take your list elsewhere instead of having to start over. This is just one of the reasons capturing user information such as email addresses is such a great idea. Although email has far lower open and click-through rates than Facebook Messenger, it can still do many things better. From sending more long-form messages to mini-courses and automation, email is still a great tool in your marketing toolbox. Combining the power of bots with the proven results of email marketing makes good marketing sense.